Butler’s softball team huddles up during a game. The Bulldogs went 1-2 against the Pirates. Jimmy Lafakis/Collegian file photo. 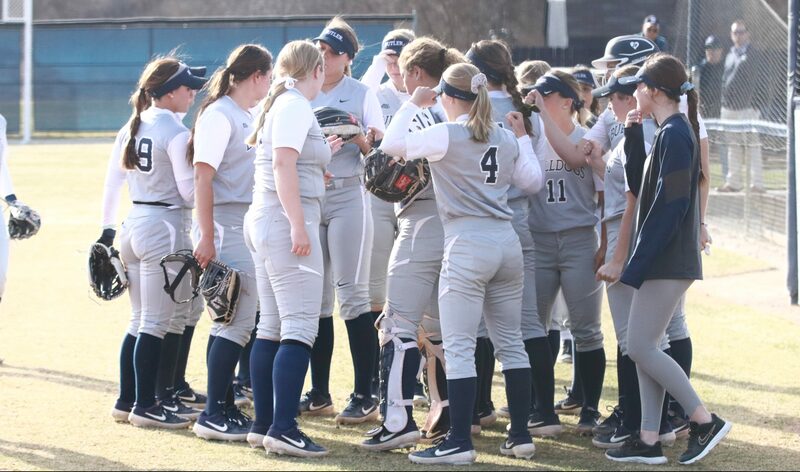 After Butler fell in both games of the Saturday doubleheader, the win allowed the Bulldogs to avoid the the weekend sweep. Candotti had not hit a homerun in her first 50 at-bats of the season. She now has three home runs in the Bulldog’s last six games after two during the series against the Pirates. Candotti hit .375 in the series and knocked in a pair of RBI. The Bulldogs opened the weekend with a uninspiring performance against the Pirates in a 12-2 run-rule loss to kick off the April 6th doubleheader. Seton Hall scored 7 runs in the home half of the first inning to bury the Bulldogs. Graves, who started all three games of the series, was pulled after facing just one batter. Kaitlin Doud and freshman Dani Deuschle combined to pitch the final four innings for the Bulldogs. The Pirates scored five earned runs off five hits from each pitcher. Candotti hit her second home run of the year in the loss. The back end of the doubleheader, much like the finale, was a victory that came off an eighth-inning home run. This time, Baylee Allender’s walk-off bomb in the bottom of the eight secured a 2-1 win for Seton Hall. Starters Alyssa Graves and Reganne Camp had not allowed a run until both teams scored in the fifth inning. The Bulldogs were able to sneak a run across on a passed ball. Seton Hall evened the score in the bottom half off an RBI single that would eventually send the game into extras. Graves threw her first of two complete games in the loss. She struck out eight batters and was responsible for both runs. Lauren Fey had two of Butler’s five hits. Butler was able to ride a complete game performance from Graves in the extra-inning win on April 7. Graves tied her career high in strikeouts with 12 and allowed just four hits in the win. The Bulldogs trailed 3-1 heading into the second inning. Seton Hall plated three runs off a pair of singles and a bases-loaded walk in the home half of the first. Butler then scattered three runs across the final seven innings to secure the win. Butler cut the the Pirates’ lead to a single run in the third as Doud homered on a solo shot to right center. In the sixth inning, Alyssa Garcia scored on a wild pitch as Fey went down swinging. For their next contest, Butler will host Fort Wayne on April 11th. The Bulldogs then welcome Georgetown for a three-game Big East series on April 13 and 14.